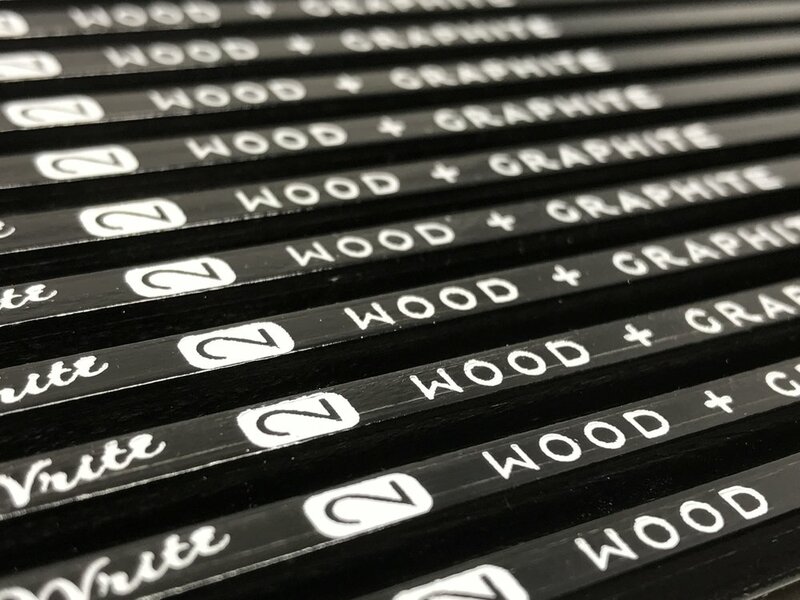 The Wood + Graphite (W+G) pencils are made by Musgrave, like all the Write pencils. As we've seen before, having Musgrave make your pencils can be a bit of a shot in the dark. The quality of their production is so hit-or-miss that even though every one of the Write pencils are #2, they're all slightly different. The hardest of the lot are the Round Natural, The Lenore, and the Telegraph. The softest are the Maroon, In the Pines, and Chesapeake. Of all the pencils, the In The Pines and Telegraph are the only cedar. They are thinner than the rest and their hex is softer. The Round Natural and Royal Blue are the only round "normal" pencils. Jumbo is round. Only Telegraph uses the standard pink eraser. The Jumbo uses the big pink eraser. Lenore is black, Quickstrike is red, and Chesapeake is orange. The rest are white. This is important because of my theory on their eraser backlog. All the imprints are left handed except for Chesapeake, which is vertical & left, and the Telegraph, which is all vertical. There is one right handed pencil from long ago. I have one around here somewhere, but I believe I may have buried so I don't use it (it's rare these days). The W+G doesn't stand out of the pack. Musgrave's white erasers always seem fresher than the pink ones. A couple cross-eyed in there. It looks great. Black lacquer, black ferrule. White eraser, white imprint. The design of the wordmark and the pill are great as always. They look modern in a retro way, where most of their pencils look retro in a modern way. Throw a pink eraser and standard ferrule on it and I could see this on Don Draper's desk. It writes nice enough. I had only one googly-eyed enough to be unusable, another few slightly off-center. The core is standard Musgrave #2, it doesn't have the accidental smoothness of the In The Pines pencil or the slightly harder feel of the Telegraph. It's all basswood and sharp hex. On a few of the pencils, the paint was a bit thin, but I could only tell in the harsh light of my little photo booth. In normal use, the glossy black lacquer looks solid and shiny. It's a little sticky and tacky, like almost-dried paint. I like when they get the white eraser, because I know they have a shot of being good. The white erasers from Musgrave are always better than the pink. They're still stiff and dry, but they always do a better job than the pink in terms of smearing and wanting to tear paper. As far as Musgrave-made pencils go, these are better than anything standard from them, like the Ceres or the Harvest. They're prettier. But I'm not sure that's enough to warrant a $12 per dozen price tag, especially when they sell 6 packs of their limited edition pencils for $5, making a dozen $10. I'd probably feel better recommending these if they were $10...but at $12 they're still cheaper than the $15 Franklin-Christoph is charging for their Musgrave pencils. Available from Write Notepads, $11.99 per dozen. Mr. Gamber, over on the now dozen-year-old Pencil Revolution, also wrote about these pencils. Check out his review. Also, while they share the same name, these aren't related to TJ Cosgrove and his popular Wood & Graphite YouTube channel. Go there and run his videos on repeat...your day will instantly improve.